It’s time to go snowboarding! We rose early for breakfast and headed off to catch the early bus at 7:30 to go up to the resort. On arriving we decided that it would be best to arrange a lesson for the both of us as John was a little bit nervous. There were also children everywhere. We found out that it was National Children’s Day or something which meant that all children were given a pass for free. We managed to grab a snowboarding teacher for two hours to show us the basics of snowboarding and hopefully get us on our feet. To start, we had a great time on the ski lifts rising up the mountain to reveal an amazing view looking down on the local area. The lesson from a local taught us about the stance to hold, how to balance, turn and most importantly stop. One of the hardest parts was using the T-bar lift which takes you back to the top of the learners slope. Designed for skiers it’s much harder for snowboarders, hilarity ensued with myself falling off and John falling yet still hanging on to be dragged along. However by the end of the lesson credit to the teacher and maybe some (questionable) natural talent on our part, we were able to navigate the small slope with multiple turns, not fall over and stop at the end. Proof? Check out the video below. and don’t forget to check out my awesome 90s gear! After the two hours we were left to ourselves and continued on the smaller slopes. Once we felt a little more confident we headed down a bigger slope. Bad idea as we fell over every 50 meters. We also had to compete with the hundreds of kids who were all amazing at such an early age. At the bottom of the slope, we ate our lunch consisting of tuna sandwiches and fruit sat down on the snow! 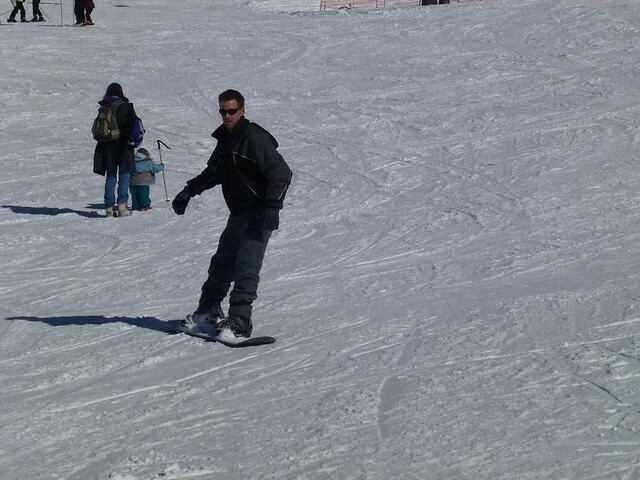 John snowboarding, he was moving at the time! We continued on the smaller slopes for the afternoon slowly improving. At the end of the day, I was shattered and opted to go down to the bottom on the ski lift whereas John snowboarded all the way down. We headed back on the bus and back home very very tired from a great day! We cooked, drank a bit of wine and then went to bed for an early night. What a great day! John loved it! 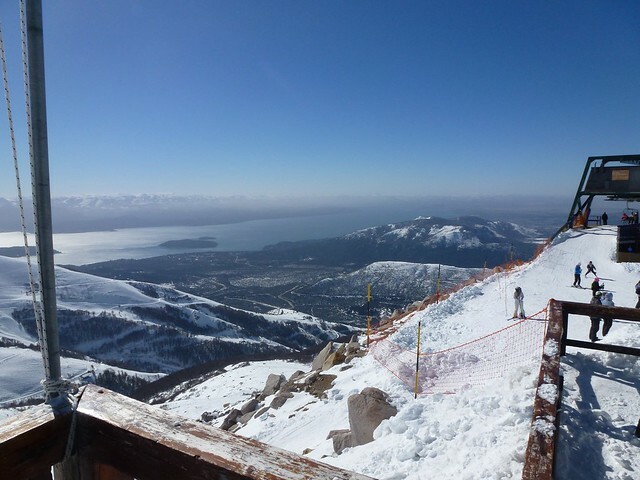 This entry was posted in Argentina, Day Trip and tagged Bariloche, Catedral Alta, snowboarding. Bookmark the permalink.